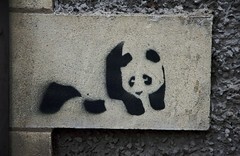 panda by Camilla Hoel, on Flickr. The Unionist MPs from Scotland (such as Jim Murphy, Gordon Brows and Alistair Carmichael) dominated Better Together strongly because they were the only people with a strong personal interest in the status quo. The majority of MSPs and councillors didn’t care all that much, and neither did most rUK MPs. It’s therefore really important that we get rid of as many Scottish Unionist MPs as possible at the next Westminster election in May, because this will weaken as future No campaign a lot. However, how realistic is it? As an example of how to read the table, the constituency of Argyll and Bute in 2010 saw 8563 votes cast for Yes parties and 35427 votes for No parties; however, the latter were divided between three parties, and the winning party (the LibDems) only got 14292 votes, which is 12032 votes less than the 26324 votes cast in favour of independence last Thursday. It’s clear that almost everywhere, more votes were cast for Yes than for the largest No party. The two exceptions are Orkney and Shetland, where there is a very strong Liberal tradition, and East Renfrewshire, which was a Tory stronghold until recently and so Labour benefits from a lot of tactical voting to keep out the Tories. In other words, in most of the country it should be possible to unseat the sitting Unionist MP if we can mobilise all Yes voters from the referendum. I do have my doubts about Orkney and Shetland, but I guess it would be quite useful to keep one Unionist MP so that we don’t have to stop telling panda jokes. Of course, this analysis is rather crude because I didn’t have access to the referendum data on a Westminster constituency basis. If I manage to find this, I’ll publish a new version of this blog post. Interesting analysis. Will it happen? I have my doubts about mobilising Yes voters, and then there’s the issue of No voters turning out to vote tactically as well. Conclusion: a couple more seats going to the SNP? I think you’re being overly pessimistic. Of course it’s unlikely we manage to unseat every Labour MP, especially the ones that are personally popular, but I think many people will have realised that Labour are now practically undistinguishable from the Tories, and what’s the point then in voting tactically in favour of the former to keep out the latter? The referendum campaign means there’s now a huge amount of anger towards Labour, especially in the Central Belt, and I would say it should be very realistic for the SNP to get more seats than Labour. Well, I’ve watched quite a few general elections where we expected/hoped for the SNP to make a breakthrough but always only got 1 or 2 more MPs. I’ll be delighted to see your scenario pan out. Bear in mind that if there is a ‘yes/no’ component to the GE, then no voters might also exert their influence on the results. I think the reason why the SNP has traditionally struggled in General Elections is because most voters at the end of the day wanted to keep the Tories out more than anything (which is why the Alternative Vote would have made a huge difference in Scotland). However, the number of seats where the Tories are either the incumbent or the main challenger is now relatively low, and more and more voters are starting to realise that Labour has become indistinguishable from the Tories. At the end of the day, it’s all about voter psychology — if most people in a given constituency think the SNP can win, then the SNP will win. One wrinkle to this “make GE about Yes/No” is that existing SNP MPs are actually in areas with big No votes! Very true, and that’s very fortunate — it would have been much harder if the SNP MPs had been in the big Yes areas!